10 Bollywood Wedding Scenes That Gave Us MAJOR #ShaadiGoals!! When it comes to Indian weddings, a dash of filmy is on every bride’s vision board. Growing up watching Bollywood movies, we’ve all thought to ourselves a dozen times how we’d love for a certain scene, song, or dance to be replicated at our wedding! Right girls? Well well, now here we are taking a walk down memory lane with a list of must have Bollywood scenes that wish we could take place at our shaadi! Which ones make up your wedding dreams? Of course we’ll start with a scene that reminds us of our besties! Sonam and her girls in those pretty cream and gold traditional Malayali saris rocking it out to Gal Mitthi from Aisha is definitely on our list! Psst – doesn’t hurt that Abhay Deol looks so damn gorgeous in the song! 2. Garden Theme Wedding Party! Do you remember the end of Zindagi Na Milegi Dobara? The whole scene/song is Pinterest goals! As Hrithik and Katrina tie the knot in what looks like a fun, vintage, fuss-free affair – the gang is being goofy as always and clicking all those pictures! Not to mention that the whole garden theme looks beautiful and intimate. Wannnnnnt! Ever since Yeh Jawaani Hai Deewani came out, it’s been giving girls everywhere major wedding goals! What adds to the beauty of the wedding scenes is the backdrop of the majestic Oberoi Udaivilas. It’s hard to pick out a scene from the movie we’d like to borrow from for our own weddings – but if we had to, it would be the beautiful morning Haldi where her near and dear ones smear the bride, Kalki with turmeric paste as per tradition and also get messy themselves. The soulful rendition of Kabira in the background makes the scene unforgettable! The 90s saw their fair share of medleys in Bollywood movies and albeit cringe-worthy now, they added a certain X-factor back then. Do you remember that rather forgettable movie Mujhse Dosti Karoge? It has this fun medley with shaadi appropriate songs and a very dramatic Kareena and decidedly intense Hrithik perform to it. Although it would be a throwback – we are adding it to our Shaadi bucket list of sorts! 5. Fam Jam Gather Up! We know, we know – the song wasn’t shot at a wedding or anything but the foot tapping number sees the whole family come together in a way that is iconic in the film! We think it’s perfect for the cocktail/sangeet night as the wedding celebrations kick off with the whole fam jam! What say? To all of you who’ve watched Shaandar – err, we feel ya sister! Though we wouldn’t mind borrowing Gulabo for our bachelorette if the cute as a button Alia and hunky Shahid or even our own goofy pals plan to kidnap us for our last fling before the ring. I mean…I really don’t see what’s wrong with that. Hai naa? 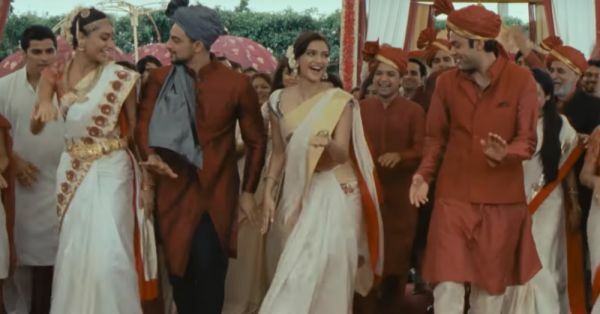 Anushka Sharma and Ranveer Singh rocking out to Ainvayi Ainvayi when they finally get married at the end of the movie, Band Baaja Baraat, is quite cute and we can totally imagine wanting to dance like crazy with new husband after all the shaadi shenanigans are done! How could we leave out Kangana as Rani rocking out to London Thumakda at her pre-wedding function!? It’s happening. Bas! Final! While it goes without saying that we’ve seen a gazillion weddings on the big screen, few have managed to capture our hearts and made us think ‘hey, I want that!’ The simplicity and warmth of Alia and Arjun’s wedding at the end of 2 States made us absolute believers in love and marriage. Alia does complete justice as the demure yet overjoyed bride and we’d love to feel the same when it’s our own turn. Now only to figure out how to look so resplendent!